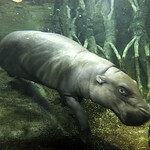 While the pygmy hippopotamus' name offers a comparison to its much-larger cousin, this semi-aquatic mammal is no pipsqueak. Adult pygmy hippopotamuses can reach six feet in length and weigh up to 600 pounds. The animals' gray skin is smooth except for bristles on the lips and tail. 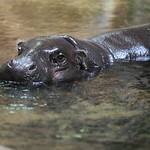 The pygmy hippo is found primarily in Liberia, although small numbers of the species can be found in neighboring West African nations. 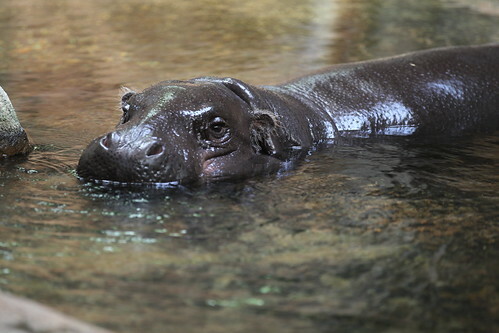 Due to habitat loss, the pygmy hippo is endangered. Because the species is nocturnal and solitary, exact population numbers are unknown, but scientists estimate that 3,000 of the animals may live in the wild. 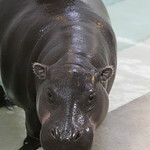 Lincoln Park Zoo cooperatively manages pygmy hippopotamus populations with other institutions in the Association of Zoos and Aquariums. The species makes its home in rivers running through West African forests. They often occupy burrows along the river's edge. 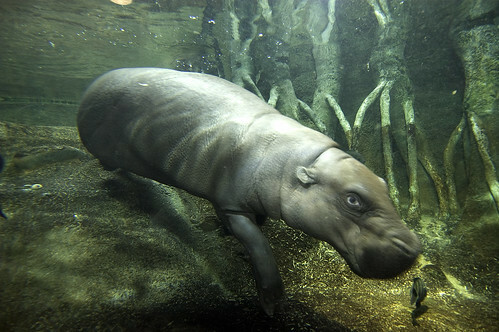 Pygmy hippos spend much of their time in the water, as their skin requires frequent moisture to avoid drying out. At night, these herbivores leave the water, venturing into the forest in search of plants and fruits to eat. They establish trails in the forest to ease movement, marking their territory with feces. 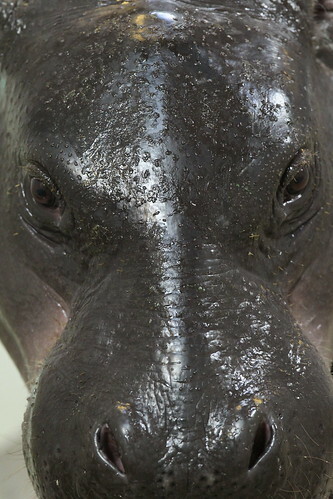 A solitary species, pygmy hippos generally come together only for breeding. 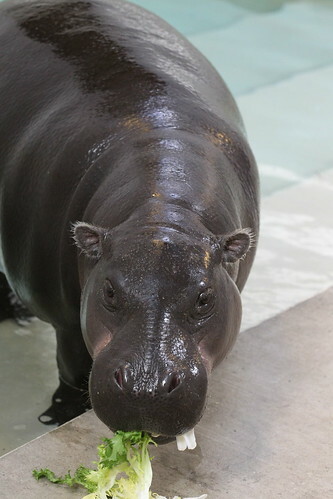 Gestation lasts six-seven months, and young pygmy hippos can swim almost immediately after birth. 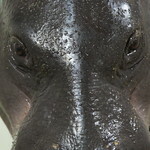 The pygmy hippo's skin secretes a red substance, giving rise to the legend that the species “sweats blood.” The substance isn't blood, but its function is unknown. Scientists believe it may serve as an antibiotic or help block excessive sunlight. The eyes, ears and nose are located on the top of the head, enabling the species to see, smell and hear while the rest of its body is underwater. The pygmy hippos' ears and nostrils pinch tightly shut when the animal dives underwater, making it easier for them to stay submerged.